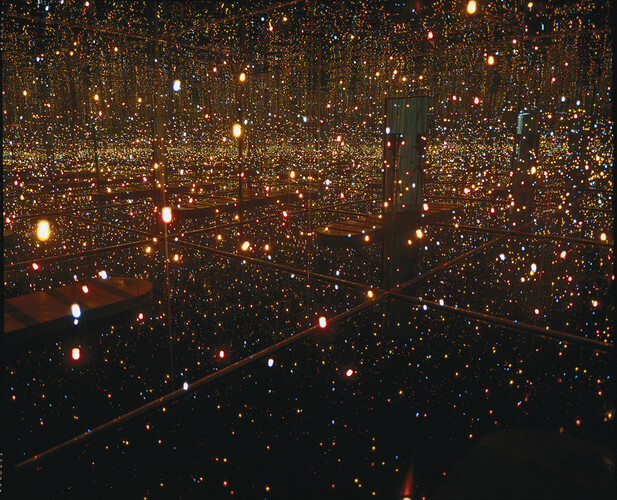 83 year old artist Yayoi Kusama is having a retrospective exhibition at the Whitney in New York and is being further celebrated throughout the city by Louis Vuitton in pop up shops and graphic store fronts. One of Japan's most prominent contemporary artists, she is well known for her decades of influence, her close friendship with Andy Warhol and her more recent time spent voluntarily in a mental hospital. We have posted a photo of her installation currently being shown in the lobby of the Whitney called Fireflies on the Water. It beautifully captures her obsession with polka dots and infinite space but should really be experienced if not in person, then through video available after the jump.